All right. Let's crack this next CABINET open. Hmm. What's the situation? Two BOTTLES and a crap-load of CUTLERY! 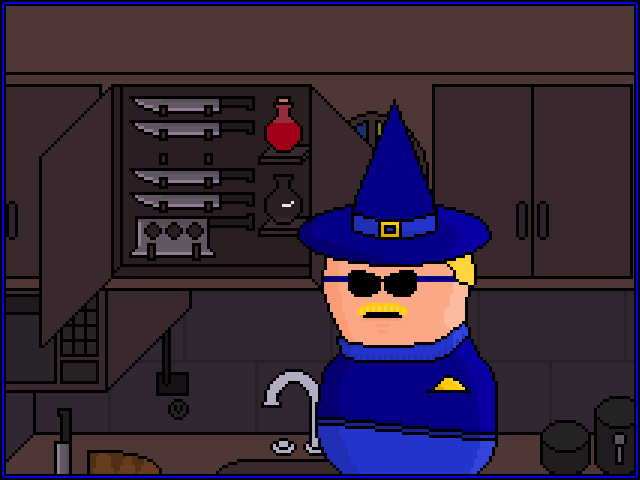 Four more KNIVES, a BUTCH'R, a RED POTION, and an EMPTY BOTTLE. There's a label on the empty one, reading "SANDWICH POISON." Where did whatever was inside there go? well crap, i hope the queen didn't eat it! If she did... I guess well rescue the king? Look for the full bottle of Sandwich Poison Antidote! Shove KNIFE (1) into MICROWAVE. Hit "Popcorn" button on MICROWAVE to distract MP from RS' distress. ...oh, wait. That's science, isn't it? Take EMPTY BOTTLE. Never know when something like that will come in handy. True, Obe. If she doesn't have a ladder running, she might try to turn the Hex into Mind Ninja-- thereby voiding the game since ninjas don't solve puzzles and any puzzle game that IS a ninja must be a paradoxical conundrum. She wins by default, rescuing herself, freeing her to discuss with Cad the consequences of his whale-tossing, zombie-making actions. Well of course the queen didn't eat the sandwich and will now use the distraction to her advantage. Who do you think added the poison in the first place! Also, take that sweet cleaver. It looks like it can have 3 materia slotted into it.